Good news! As announced in our recent press release, we are now part of a very elite group of Google Analytics Premium Authorized Resellers! Many web advertisers retain only the fact that this is a paid version; very few are aware of the capabilities that make it a leader in its category. After seeing what Google Analytics Premium is capable of, we were convinced of the power this could have, especially in a world where data is (or should be) at the heart of our decision-making. Let’s start by debunking a myth that’s been hanging around for a long time: Google Analytics Premium is more just an enhanced copy of the standard version! It’s true that this version bears a resemblance to the standard version, but it is entirely more powerful, and has exclusive functionality. We’d like to focus on a specific functionality that we’re particularly enthusiastic about at Adviso. We know that attribution is a constant problem and regular source of headaches to advertisers, sellers, and marketers. It’s difficult to find a perfect way to attribute credit to each channel that contributed to a sale or conversion. Even the functionality to create a personalized attribution model carries an analysis bias. Essentially, really, a visitor might have clicked on (or just looked at) any number of organic campaigns before making a purchase decision. Obviously, it’s a real puzzle to isolate the investment that actually made the difference. Google Analytics Premium offers a data driven attribution model that evaluates thousands of combinations of channels to find the actual synergies. The model is based on a powerful algorithm, and makes use of Google’s enormous data processing capabilities. The algorithm uses the mathematical principle of the Shapley model, capable of transforming the way data is attributed by using a probability-based model. That’s why you can’t rely only on the last impression or last click – hence the principle of data driven attribution. I beg your pardon? These next few visuals should make it more clear. 1. 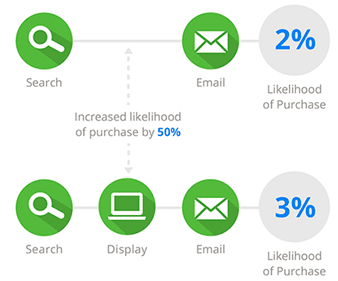 The algorithm studies each visitor’s customer journey, whether they end up purchasing (or converting) or not. Then, based on a prediction of the impact of each channel on the final conversion, it assigns values to each of your marketing touchpoints. 2. The probability model defines a conversion rate for a particular customer journey, then compares this rate to that of a comparable group of visitors who followed a different customer journey. 3. To visualize the results of the Shapley model on the attribution model, Premium users need to refer to the Model Explorer report. 4. Now all that’s left is to compare the result with the default attribution model, adjust the combinations, and test. This is how attribution based on the Shapley model will help you get past the problem of last-click methodology. By testing different campaign combinations, you will be able to see which of your investments are paying off, without the bias introduced by a static attribution model. You no longer have to predict your attribution model, because Google Analytics Premium does it for you, based on the reality of your business.